The theft of metal from churches in the West Midlands has resulted in a huge increase in insurance claims. In the Lichfield Diocese, the number of claims is up three-fold this year from 24 to 72. The thefts are usually of lead from roofs, flashing, copper piping and lightning conductors. Churches are now introducing SmartWater, pioneered by a Telford firm, which is a marking paint that could deter thieves. Nationally, Ecclesiastical Insurance received more than 1,800 claims from Anglican churches this year at a cost of nearly £5.8m for the theft mainly of lead from roofs. The Holy Trinity Church in Heath Town, Wolverhampton, has been targeted seven times, said church spokesman Gavin Drake. 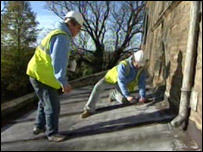 He said the thieves had used scaffolding put up to repair the church to get back on to the roof and steal more lead. SmartWater is being sent to every Anglican church covered by Ecclesiastical Insurance, totalling more than 16,500 churches.